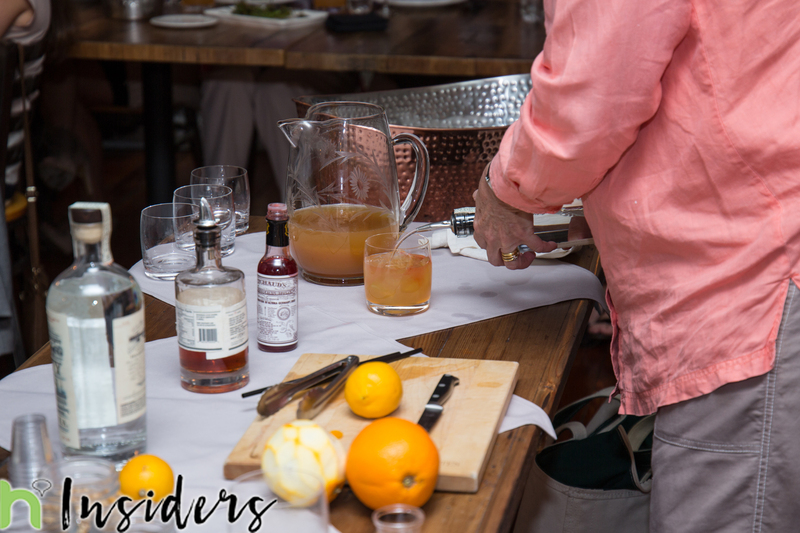 Local Insiders attended a private tasting event on September 14, 2017 featuring W.P. Palmer Distilling Company of Philadelphia at the recently remodeled Royal T’s at the Mansion Inn in New Hope, PA. The Mansion – a magnificent manor home on Main Street in New Hope that’s been a notable part of Bucks County’s history – has been saved, transformed, and restored over the years. What once served as a doctor’s home and practice quickly became a highly sought after piece of Main Street New Hope property. The building has since been transformed into what we know today as The Mansion. The manor – which boasts a restaurant, 5 hotel rooms, event space, and a swimming pool – was recently adopted by two New York City businessmen turned foodies. They offer food that has been inspired by classics that you know and love, re-imagined in a way that makes you question everything you know and love about some of your favorite dishes. Attendees munched on Blistered Shishito Peppers with a miso glaze, Ricotta Toast, Pastrami Egg Rolls, Coconut Shrimp, and Royal T’s Sliders. W.P. Palmer Distilling Company was established by Walter and Kathy Palmer in Philadelphia in 2014, focusing on the 4 basic elements of fire, water, earth & air. Their spirits are crafted by hand using traditional methods and 100% Spring Water from the mountains of Pennsylvania. Insiders sipped on a seasonal specialty cocktail as well as samples of Liberty Gin, which is made from an Old Dutch recipe with ties to the spice trade during the American Revolution. Liberty Gin uses only six classic ingredients of Juniper, Coriander, Angelica, Cardamom, Lemon Peel, and Grains of Paradise, and is distilled over a open flame in a traditional Copper Pot still. W.P. Palmer is open for tastings and tours in Manayunk (376 Shurs Lane, Philadelphia Pa 19128). If you’re interested in attending future events throughout the Philadelphia region, you can learn more about the Insiders Club here.